Recently, when a neighbor’s son started medical school, he told me he would have to learn 15,000 new words in the next four years. What I found most interesting was that as a college graduate, his vocabulary already consisted of approximately 15,000 words. Although I don’t have a precise number of new terms, skills or techniques I mastered during my memoir writing process, I mention this young man’s experience because it reminds me of the steep learning curve I climbed while writing my book. Most people take a few years, maybe even ten, to write a book. 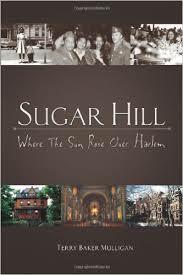 My memoir, Sugar Hill Where the Sun Rises Over Harlem describes growing up in Harlem from approximately 1952-1962. I first started working on the book in 1974 when my memory of Harlem’s mid-century transitions, and mine, was still vivid. I finally finished it in 2011. Sugar Hill was published in 2012. That’s exceedingly slow, but years of delay worked in my favor because I had a story to tell, but needed to learn how to write it. I took writing classes, workshops, attended conferences and joined writers groups so I could get critiqued. Then I had to learn how to accept the criticism. I read as many books as possible, especially memoirs, and took notes on what I thought worked well and what didn’t. In 1995 two memoirs were published: Mary Karr’s The Liars Club and James McBride’s The Color of Water. Karr’s growing up around East Texas oil fields, honky-tonk saloons and insanity, couldn’t have been more different from mine, yet we had much in common. I admired her honesty, identified with her vulnerability and above all, this resilient, tough-talking Texas kid reminded me of Harlem. She also made me realize that I needed to come up with the right voice for my Sugar Hill story. At the same time, McBride’s unique and entertaining story about his quirky Orthodox-Jewish-mixed-race Harlem heritage reassured me that I too had a tale worth telling. King is referring to those parts of a manuscript that we fall in love with, even if they’re killing the story instead of helping it. Sometimes it’s a character, a phrase, an image, a joke, a chapter, etc. When I killed my darling passages and a mostly irrelevant chapter that had been hanging around for some twenty-five years, I finally produced a workable manuscript.